BSA Plant Images Online - Computer-generated three-dimensional reconstruction of the male germ unit of rye (Secale cereale) based upon serial ultrathin sections. Computer-generated three-dimensional reconstruction of the male germ unit of rye (Secale cereale) based upon serial ultrathin sections. The two elongated sperm cells are connected at one end and each contains some plastids (green), as well as numerous mitochondria (red) and a nucleus (blue). 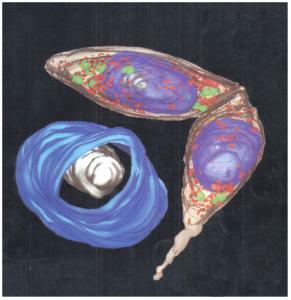 The vegetative nucleus (blue) is closely associated with the sperm cells, but not connected; it contains a single nucleolus (white).